Emergency ID Key Tags / Mini Tags are highly visible, but subtle at the same time. 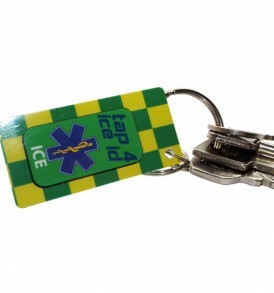 The medical ID Tags have ambulance style battenberg, the paramedic star and ICE on one side. On the reverse simple instructions on what to do in case of emergency. Sports ID, Medical ID made simple using NFC Technology.